To be a world class Mint, and a global brand in providing lifestyle products and services relating to currency, collectibles and premium gifts. To be a world-class company in currency-related gifts and collectibles, and lifestyle products and services at competitive prices, giving value-added services that delight our customers, focusing on developing our employees' potential so as to achieve above-average returns for our shareholders and contribute towards the well-being of our society. The Singapore Mint was established in 1968 by Dr Goh Keng Swee, then Minister for Finance, to cater to circulation coin requirements after Singapore's independence. Throughout the years, we have constantly been at the forefront of new minting technologies, maximising on hybrid techniques to create high security and innovative features on circulation and commemorative coins. Leveraging on our core competencies, we provide customised corporate services, as well as quality currency-related gifts and collectibles, and lifestyle products and services, to the local and overseas markets. We are also proud to continually showcase highly innovative and meticulously designed products that appeal to a wider, growing audience. For our stringent guidelines on quality standards, The Singapore Mint has been awarded ISO 9001 and ISO 14001 certifications. Now a fully integrated facility catering to program concept, product design, marketing, sales and distribution with after-sales services, we continue to strive towards enhancing our long-term technical capability and maximising customer satisfaction. Moving forward, building upon the recognition and goodwill gained, we aim to position ourselves as a prominent market leader in the international arena. As a leading mint and a pioneer of local industry, we pledge our unwavering commitment to you - our customers, business associates and partners. The Singapore Mint offers only the best in quality, value and service. A new era of business environment in the 90s spurs The Singapore Mint to focus on harnessing its minting capabilities and initiating creative marketing approaches to meet new challenges of the 21st century. In the 1990s, the Mint saw the need to fine-tune its quality management system to meet internationally accepted standard. In 1993, it was certified to the ISO9002 standard. Capitalising on the total integration of core competence, which included successful process development for new product innovation, the Mint pursue its ISO9001 certification. In 1995, it was certified to the ISO9001 standard for design and manufacturing of numismatic and circulation coins, medals, medallions and minted products. This has placed the Mint as one of the few mints in the world, which has been certified to this ISO9001 international standard. Credible testaments to the Mint's dedication to quality were also recognised. In 1986, the Mint was awarded a gold medal for a National Quality Circle Convention Stage Presentation. It also received a ST Quest Silver Award in 1995 and subsequently a Gold Award in 1996 and 1997 from Singapore Technologies Pte Ltd (STPL). Other prestigious awards received by the Mint include two Chew Set Chai Awards for innovation in 1995 and two Cheng Fook Choon Awards for process innovation and improvement in 1997. To support its customer-oriented approach, the Mint has set up several retail and customer service outlets located at convenient venues to serve its customers. Customer services has also extended to more than the traditional method of receiving orders through mail ordering, such as using the telephone ordering system, internet, fax-on-demand facilities and over-the-counter purchases at our conveniently located outlets. We have also taken one step forward to launch our very own web site in 1997 as an extension of our services to our customers. 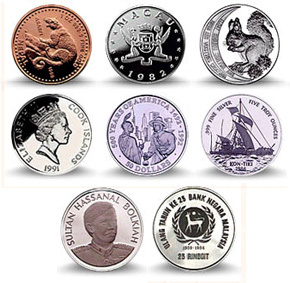 This web site provides comprehensive and up-to-date numismatic information of the mint's products and allows customers to order online and communicate directly with the Mint. Expanding into new horizons has always been of priority to the Mint. In its strive to seek new international markets while it builds an extensive overseas marketing and distribution network, the Mint participates in prestigious coin shows including the ANA Coin Convention in USA, the Tokyo International Coin Convention in Japan, the Beijing Coin Convention in China and many others. As Singapore gradually gains recognition as a financial hub in the 1980s, The Singapore Mint also transits into another exciting phase of development. Having made headway in the 1970s, the Singapore Mint was incorporated as a private limited company wholly owned by government-linked companies in the 1980s. This new 'government-linked company' status endorsed the Mint's excellent performance and rendered it independent. The 1980s was further characterised by variety in production, refinement in product design and packaging and extensive effort in international marketing. Many overseas projects, including both government and private commissions, were added to the Mint's portfolio of prestigious customers. They include Andorra, Bermuda, Cook Islands, Fiji, Israel, Macau, Malaysia, Negara Brunei Darussalam, Solomon Islands, Switzerland, Tokelau, Tonga, Uganda and USA. In 1981, BCCS issued the Year of the Rooster coin, which is the first coin of a highly popular lunar coin series. And not to forget the commemorative coins, which captured the various milestones in Singapore's history. These coins mark significant events such as the Official Opening of the Changi Airport (1981), the Official Opening of Benjamin Sheares Bridge (1982), 25 Years of Public Housing (1985), the Operation of the Mass Rapid Transit (1989) and many other significant coin issues. 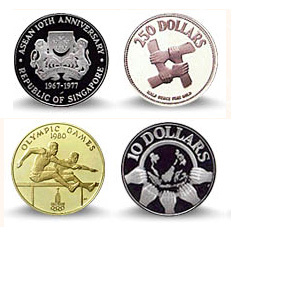 In 1987, the Mint was involved in organising the first Singapore International Coin Convention (SICC). The Singapore Mint struck its first largest 12 oz pure silver medallion of 88mm in diameter. The 1970s was a decade of building and preparing a strong foundation to meet the many challenges ahead. The fledgling mint was earning for itself kudos and proving its mettle on the international scene. In 1972, the Mint won her first foreign commission to mint 20 million pieces of the 50 Centavos circulation coins for the Philippines. In the late 70s, more countries such as Nepal and Samoa (formerly known as Western Samoa) were added to the list. A modern foundry was also added to the existing facilities, boosting the Mint's capability of producing quality coins from base metal stage. Back on the home front, the Mint proved itself a loyal chronicle of Singapore's eventful history. In 1975, when Singapore celebrated its 10th Anniversary of Independence, BCCS marked this important event with a $10 silver coin and gold coins in denominations of $100, $250 and $500. These coins bear meaningful designs, which attest to the government's success in providing public housing and a harmonious multi-racial society for its residents. Besides the Mint's core business in minting coins, it also provides an extension to its capability to include customised minting services of military medals, service award medallions and corporate memorabilia. In 1967, Singapore decided to join the Association of Southeast Asian Nations (ASEAN) with Indonesia, Malaysia, Thailand and the Philippines. Ten years later, to commemorate the successful contributions by the group towards unity in the region, a $10 silver coin was issued by BCCS. Since then, a commemorative coin is minted every decade capturing the significant changes within ASEAN. Striking out on one's own is the beginning of the history of modern Singapore. When its fate was decided on 9th August 1965, the island republic had to carve a niche for itself. There was so much to do. One of the first few steps taken was by having a currency system of its own. Singapore then had been using a common currency issued by Board of Commissioners of Currency, Malaya and British Borneo since 1953. In 1967, Board of Commissioners of Currency, Singapore (BCCS) was established by the Currency Act of 1967. The Act confers on BCCS the sole right to issue currency notes and coins in Singapore. This is followed by the issue of the first series of circulation coins with various designs representing a dramatic break with previous currency which borne the effigy of the reigning British monarch. The coins were also different in terms of the material used, shapes, sizes and denominations. By the following year, 1968, when The Singapore Mint was established, Singapore was making its own coins. Dr Goh Keng Swee, recognised that minting coins required precision engineering and high security. As a result The Singapore Mint was set up as a department of the Chartered Industries of Singapore. The Mint has, since its establishment, undertaken most of the minting of Singapore's circulation coins. 1969 marked the 150th Anniversary of the founding of Singapore. To mark this occasion, BCCS has commissioned The Singapore Mint to mint the $150 Singapore 22-carat gold coins featuring the Raffles Lighthouse. This coin is also the first commemorative coin minted by The Singapore Mint.